The Converse Blog: The Converse Blog: Sun Yue aka the Perfect Storm. The Converse Blog: Sun Yue aka the Perfect Storm. I hate to throw out words like Perfect when describing any situation, but I can't seem to find a better way to describe the idea I have. As the title of this post suggest, Sun Yue is going to be the main focus. 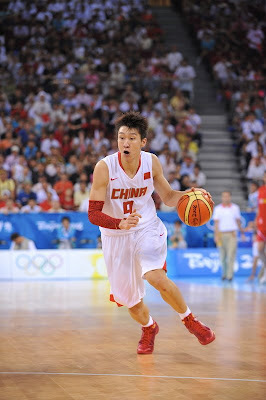 Just before the first game of the Olympcis tipped off, the Lakers and Sun Yue agreed to a contract. As you may or may not know, Sun was selected by the Lakers in the second round of last years draft, pick 40 to be exact. When I first read about the Lakers signing Sun, it was always accompanied with his nickname, the "Chinese Magic Johnson." This really got the wheels turning in my head, which is the origin of this post today. There are two main reasons why Converse signing Sun Yue would be a perfect storm. Regardless of the team he signed with, it would be great to have a pipeline into the Chinese marketplace. It's no secret that tapping into the Chinese market makes great business sense. Reebok has had a lot of success with Yao and Nike is really pushing Yi during the Olympics. Despite the belief that "big men" don't sell shoes, I think anyone would agree that Reebok's relationship with Yao has been positive for them. And while I don't expect Sun to be the superstar that Yao is, he has the potential to establish himself as the second biggest star in Chinese basketball. Maybe I am buying into the hype a little hard, but you don't get a nickname like "Chinese Magic Johnson" without merit. Over the last month you've voted in a poll asking which NBA Team does Converse most need an endorser on? The results are in and I couldn't agree more, the Boston Celtics pulled ahead recently and took home 43% of the votes. The Lakers came in a strong second place with 33% of the votes. Interestingly enough, the Toronto Raptors squeaked out a third place finish. In Sun, Converse could have that key endorser on the Lakers. This would be a fantastic situation to have a connection to the Chinese market and have a player on the Lakers. However, there would be some obstacles to pulling off this deal. Obviously this is assuming that Converse would want to sign Sun and that Sun would want to play in Converse. So assuming that those two issues would pan out, there would still be another obstacle in signing Sun. It would appear from the pictures I've seen that Sun is signed by Nike. If this is true, then the case could be made to Nike that it would greatly benefit Converse to secure the services of an NBA player on the Lakers and from China. I would love to see this happens, but this is merely a fan running his mouth about something he thinks would be a great idea. However, it just seems wrong that the "Chinese Magic Johnson" would wear anything besides Converse. Anyway, I am just saying....thanks for checking out the blog, come back tomorrow for shoes, I promise.